Women ministers are making dramatic strides in achieving equal pay with male clergy. The gender pay gap shrunk from women clergy making 60 cents on the dollar compared to men in 1976 to 93 cents on the dollar in 2016, substantially less than the 22-cent gender disadvantage in the general population, a new study finds. That is not to say women clergy still do not face significant obstacles to equal pay, researchers noted. Married female clergy, and women ministers with children, on average earn less than single women. And study authors said there is still evidence of a stained-glass ceiling in that women are disproportionately in part-time and lower-paid non-congregational jobs. Nor are all boats rising at the same rate with regard to clergy pay. Some 42 percent of the difference in the closing of the gender gap was related to slower increases in compensation for male pastors, researchers said. • The rising number of Americans choosing not to affiliate with a religious group, which reduces clergy demand. “We might be at a point where we see a general devaluation of the clergy occupation,” lead researcher Cyrus Schleifer said. Researchers have faced difficulties in analyzing gender compensation gaps among clergy – and comparing figures with other occupations. It is hard to find national data with enough numbers of women clergy and to account for the benefits minsters receive in the form of housing allowances or living in church-provided residences. In their study, researchers Schleifer and Amy Miller of the University of Oklahoma analyzed data on working clergy ages 18 to 65 from the Annual Social and Economic Supplement of the Current Population Survey from 1976 to 2016. The survey, administered by the U.S. Census Bureau, is widely used in measuring economic inequalities and provides information on the housing benefits that are a special part of clergy compensation. The study results were just published online in Sociology of Religion, a prominent, peer-reviewed journal. • Dynamic movement toward equal pay: Consider that congregations as a matter of religious freedom are free to hire who they want as their spiritual leader and that many Scriptures are interpreted as modeling traditional gender roles. That makes it all the more surprising, Schleifer said, that the income disadvantage between male and female clergy fell in the last four decades to less than a dime on the dollar, below the pay gap of many government agencies under gender discrimination laws. “It’s good news for the religious communities,” he said. • The married-with-children penalty: Some women benefited more than others. Married female clergy make around 28 percent less than male clergy. This may go back in part to the traditional assumption that a male pastor’s wife would serve as unpaid labor; there is no similar expectation for clergy husbands. The study also found that female clergy with children in their home are paid less than female clergy with no children. • And the highest paying jobs still are more likely to go to: Men. Around 21 percent of female clergy are part-time, compared to only 4 percent of male clergy. In a separate finding that researchers said also reinforces the idea of a stained-glass ceiling for women clergy, male clergy who work in non-congregational settings such as church agencies, school and hospitals make around 11 percent more than congregational clergy. But there is no such wage benefit for women clergy, indicating men are more like to serve as agency heads or school administrators, while women are more likely in lower-level positions. • Wage hikes for men? Not so fast: Male clergy show an average yearly increase of around 0.2 percent compared to workers in the general population. Female clergy show a faster rate of change at around 1.3 percent each year. The national study was not able to compare clergy pay by religious groups. But its findings are consistent with other research indicating that even though advances are being made, gender bias persists in many denominations. 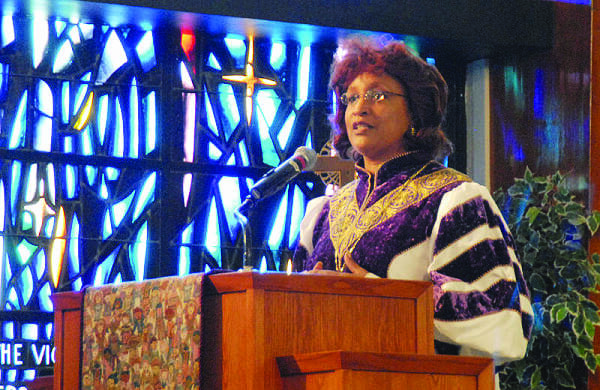 A 2016 survey of 224 clergywomen in the Evangelical Covenant Church found women “have struggled in finding jobs and are concerned over the underrepresentation of women at all levels of leadership.” Some described the denomination as a “good old boys’ club,” reported researcher Lenore M. Knight Johnson of Trinity Christian College. The findings also seem to give credence to other research on gender bias – sometimes called occupational feminization theory – that suggests that rising numbers of women in an occupation may result in a loss of status and value in the profession as it is seen as more feminine. Despite these continuing hurdles, Schleifer suggests, “My sense is we’re moving in the right direction” in addressing clergy gender bias. But even as younger generations in society embrace and experience greater equality, shifting cultural attitudes takes time, Schleifer noted. “While our results highlight growth in gender income parity among American clergy, there are still barriers to female mobility within this occupation,” he and Miller concluded. For female and male clergy already coping with a shrinking market of worshippers, how fast attitudes change may impact everyone’s bottom line.